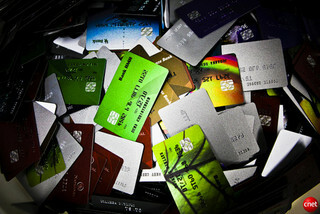 First and foremost, credit cards are NOT your friends. Despite what their ads may say, they don’t want to help you out. They just want your money. Whenever I talk about finances, I always have people who want to tell me what a smart financial move it was to get a certain credit card. Or worse yet, several credit cards. They talk about such things as using other people’s money, grace periods, cash back and the most popular – frequent flyer miles. I have been to all 50 states and every major city in America. While some cities are much different than others, one thing that almost every city has in common is that the tallest building in the downtown area is a bank. In many cities, the tallest several buildings are banks. Banks do some good things. But do you think for one second banks would be able to build those huge buildings if they weren’t making a ton of money off of their customers? Do you really think that those buildings would exist if the banks were really giving a ton of cash back and paying for a lot of plane tickets? Of course not. The next time you drive by a really tall bank (or fly over one, because many can be seen from the sky), realize that your money helped build it. Here’s another way to look at it. 17 of the 20 largest hotels in America are in one city – Las Vegas. Why do you suppose that is? It’s not because their guests are winning in their casinos, is it? And most companies that offer credit cards aren’t actual banks. There are some 6,000 companies that offer major credit cards. Do you really think they would be doing this if they weren’t making loads of money? If a credit card company offers you some kind of perk, they just want you as a customer. Just like a store that offers a “buy two, get a third one free” deal does not want you to have a free item. They want you to pay for the other two. And it works.